Disney's Frozen Sing Along Elsa Just $24.91! Down From $40! You are here: Home / Great Deals / Disney’s Frozen Sing Along Elsa Just $24.91! Down From $40! Disney’s Frozen Sing Along Elsa Just $24.91! Down From $40! Right now you can get this Disney’s Frozen Sing Along Elsa for just $24.91 (Reg. $40) at Walmart! Kids will have so much fun acting out their favorite scenes with the Disney’s Frozen Sing Along Elsa Doll, which comes With a Bonus Necklace. This is your child’s chance to have that duet with a favorite character. The microphone is designed to recognize who is singing. Thus, if you place the mic near Elsa’s mouth, she will sing the full-length version of the award-winning “Let It Go.” With the Disney Sing Along Elsa doll, your child can hop into her favorite part and have Elsa pick up where she leaves off. 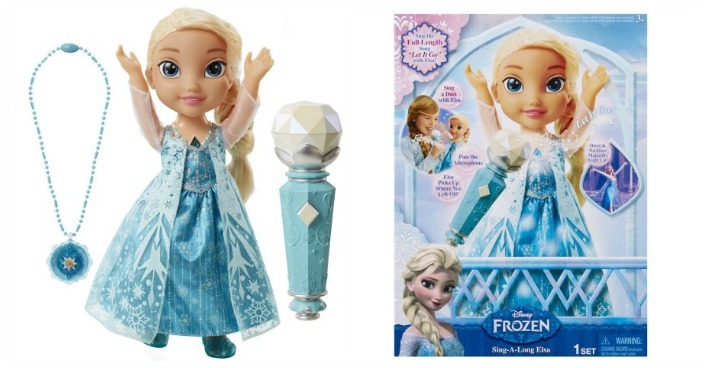 This Disney Frozen Elsa doll is dressed in her iconic snow queen gown. It requires five AAA batteries to operate.